If your home is worth compote, and you don't know what to do with it, it is possible to prepare a delicious, flavorful homemade wine. The cooking process is quite simple, only need a little dough and sugar. The main thing to remember that the utensils for making wine needs to be glass or wooden, in any case not a metal one. A cooked winem hands you can entertain guests and friends round the festive table. - plasticine or paraffin wax. The first thing you need to separately prepare the starter. For this you will need 200 g raspberries (do not need to wash, should be rubbed with 100 g of sugar. Add a little water and leave to quasits in a cool place for 3-4 days. The berries need to be washed because on the surface of the berries are natural yeast. 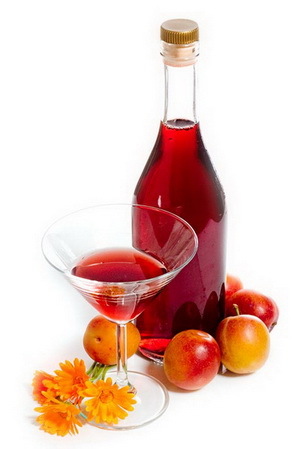 In the compote, add a little more sugar and pour into pre-washed and scalded glass bottles or banks. The compote to pour not to the brim, leave room for fermentation and fermentation. For every 3 liters of juice with lots of sugar add 2 tbsp of starter in the form of pureed raspberries with sugar. The raspberries can be replaced with raisins, in this case, a three-liter jar need to add 120 g of unwashed raisins. You can add to each bottle a little honey, it will significantly improve the taste and aroma of the wine. Now you need to prepare your corks for bottles of the appropriate size. Roll any size ball of cotton wool and wrap with gauze. Plug this with a cork the bottle and put the container in a dark place. After 7-10 days, the berries will rise to the surface, they must be removed carefully. The remaining liquid strain and pour into clean bottles or jars. To prepare a water seal. For this you need to make in the plastic cover small hole and insert a rubber tube. Connection place paper over clay or wax, the other end of the tube dip into a container of water. Banks with the water-gate, it is necessary to remove 1.5-2 months in a warm place until fermentation stops. This can be seen in the termination of allocation of bubbles in a container of water. By the time the wine should be transparent and precipitate. Cooked wine, carefully, by means of a flexible hose to drain from the sludge. Pour into clean bottles, close the caps and let stand in a cool place for 1-2 months.